Jeanetta E. Gross, 89, of St. Cloud, formerly of Watkins, passed away on Saturday, March 16, 2019 at the Annandale Care Center. Mass of Christian Burial will be 10:30 a.m. on Thursday at St. Anthony Catholic Church in Watkins. Fr. Aaron Nett will officiate. Interment will be in St. Anthony Catholic Cemetery. Visitation will be from 4:00 to 8:00 p.m. on Wednesday and from 9:30 to 10:15 a.m. on Thursday, both at the Ertl Funeral Home in Watkins. Parish prayers will be at 4:00 p.m. on Wednesday at the funeral home. Jeanetta was born on March 22, 1929 at Kimball to James and Elnora (Schacht) McKenzie. She married Frederick “Jim” Gross on November 19, 1949 at St. Anthony Catholic Church in Watkins. They resided at Watkins and Jeanetta worked as a seamstress at Litchfield Garment Factory. She also was employed at Fingerhut in St. Cloud and the canning factory in Cokato. 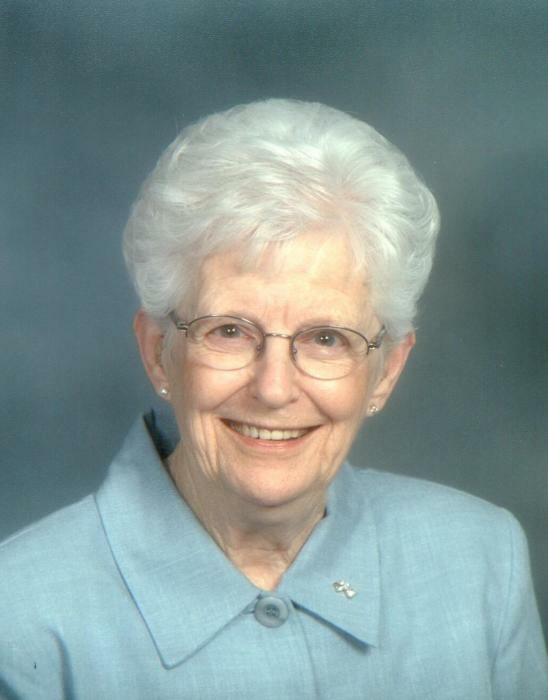 She was a member of St. Anthony Catholic Church in Watkins and the Watkins Legion Post #453 Auxiliary. She enjoyed quilting, crocheting and knitting and she was a member of the Whitney Center Quilting Group for many years. Her husband, Jim, passed away in 1992 and Jeanetta moved to St. Cloud in 1993 where she was a member of St. Michael Catholic Church. She moved to Garden View Assisted Living in Watkins for a short time prior to becoming a resident at the Annandale Care Center in March of 2018. Jeanetta is survived by her children, Luanne Gross of New Hope, Patricia Wardlow (John Guerrero) of Bloomington, Gary “Toad” Gross of Chalen, WA, Bob “Sherman” (Mary) Gross of Watkins, Kathy (Mike) Trossen of St. Cloud, Barb (Tim) Miller of Lino Lakes, Marianne (Gerard) Robeck of Albertville; 13 grandchildren and 15 great grandchildren; brothers, Jerry (Judy) McKenzie of Kandiyohi, James (Darlene) McKenzie of Kimball; brother-in-law, Gene Steman of Watkins. She was preceded in death by her parents, husband, sister, Shelva Steman and one grandchild.